Prokurative is synonymous with portico, decorated promenades of cardo and decumanus, main streets of the Diocletian’s Palace. This architectural details was used by the Venetians on their central square in front of the cathedral of St. Marco, and major of Split Antonio Bajamonti, returned it here in the early 19th century. Here, at Prokurative, Bajamonti also built a large theatre that was soon destroyed in the fire. But the cultural tradition of this square is still reflected in the traditional festival of Dalmatian song, held here since 1967.Unfortunaltely, except for that the square is not much in use. Its neo Renaissance beauty, today attracts the “clicks” of digital cameras and children’s game of “indoor” soccer. 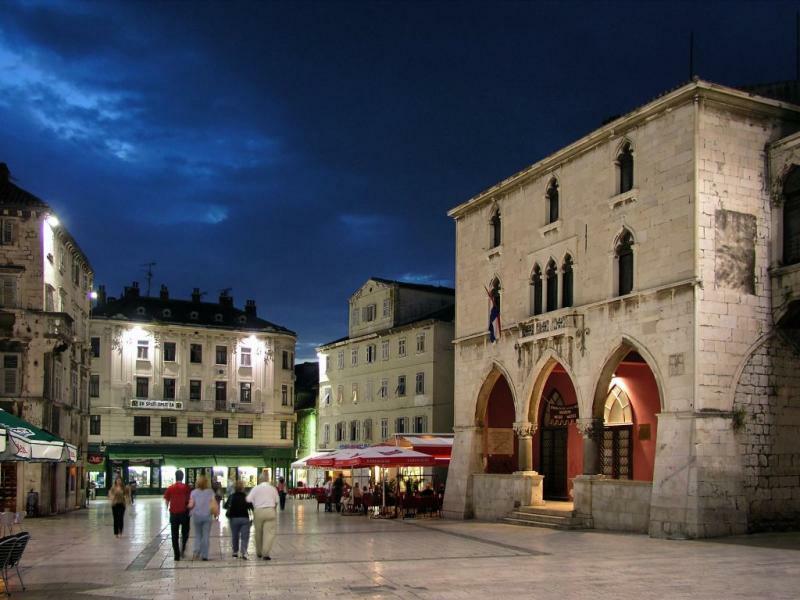 Pjaca (Narodni trg) is first mentioned in the 13th century as “Širina sv. Lovre”. With its architectural diversity and impressive dynamics of living Pjaca always managed to surprise its visitors, even the “natives” who rarely look up to take in their surroundings. If you approach it from the imperial decumanus, above the Iron Gate you can hear the sound of the Renaissance clock, separated with Roman numerals in 24 parts, which is raised on the remains of the Roman tower. The geometrical harmony of its surface sets apart the first city hall, with its 15th century gothic decorations. In 1950 in its portico a popular soccer fan group “Torcida” was founded. Right next to the former city hall is a Renaissance palace of the long gone aristocratic family Karepić, on whose southern façade there is a spectacular coat of arms under the balcony. Just across the square hotel Central offers an invitation to have a cappuccino in the local café. During its Golden Age this is where a “Table of Wise Men” used to be (gathering of famous artists and public figures) . Along the western wall of the Palace, with a view to the Pjaca, is located today active synagogue from the 16th century. Pjaca is a traditional meeting place for all the ages and until the sixties there was unspoken rule about the separate sections of the square reserved for schoolchildren, students and bachelors.